As the refurbishment of the Glenside Halfway House neared completion, attention turned to development of the Halfway House grounds. The aim is to create a setting that is appropriate for the era of the building and which can be used as a community asset. 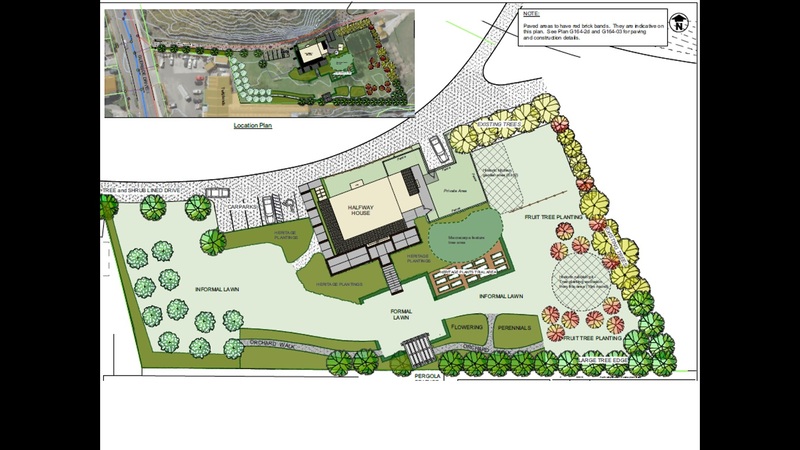 Both the Wellington City Council (WCC) as owner and the Glenside community are contributing to this task. To provide hands-on effort in the grounds, a group of volunteers formed the Halfway House Heritage Gardeners. Both WCC and the Heritage Gardeners collaborate to progress a suitably agreed way ahead for the garden and grounds. Following community consultaton, the WCC provided a draft concept plan for discussion with the group. The plan, designed by Charles Gordon, can be seen below. Click on the picture to view a larger image. Click your browser 'back-arrow' button to return to this page. As well as working in the grounds, the Heritage Gardeners are researching New Zealand heritage garden plants, flowers, fruit, vegetables, and early settler gardens. They seek a good understanding of the lifestyle of our early settlers to ensure the domestic needs of these pioneer gardens is well represented at the Halfway House. The Glenside values of natural green spaces, the stream and wild places to explore is also relevant. The Heritage Gardeners focus therefore leans more towards soft and natural, rather than towards the concrete and tar-seal symbols of modern lifestyles. Other menu links in this section will provide information on progress with the garden development and with research conducted on the gardens of local early settlers.